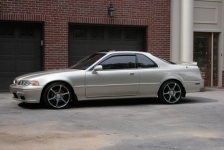 1995 Acura Legend LS Coupe 6spd. JDM TYPE II, 6spd trans (lower mileage). 5-spd flywheel, EXEDY clutch. Fut MLS strut bar, H&R springs,Monroe shocks,ADDCO Front & Rear sway bars, FUT Tie Bars,SPC ball joints, MOOG Front Upper control arm anchor bolts, EBC ULTIMAX Rotors f+r,AKEBONO ceramic pads f+r. Poly mounts(60a). BLACKEND damper.18x8 40 offset KONIG Verdict. BF GOODRICH G-Force T/A KDW.